Then their building was completed and ready for them to move in, the artist and mechanic couldn’t have been happier. Accessories: 18” eave and gable overhangs on 3 sides. A wife and husband had different ideas on a building that they wanted and they couldn’t settle on one design. She wanted an art studio to paint and showcase her work; he wanted an RV garage and workshop to work on his motor-home and car. 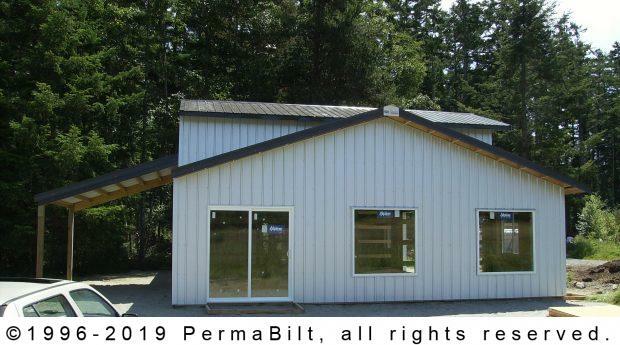 So when they talked with their PermaBilt® Building Representative who’s provided a variety of solutions and options, the Lopez Island Washington couple were able to agree on a building design that suited both of them. It was a high/low building. In other words, two buildings, one higher than the other, that seamlessly came together. They thought it was a great solution. Once design, financing and permitting were done, the construction crew was ready to start the building. The couple had chosen a post frame building because it used large, solid posts as the foundation. 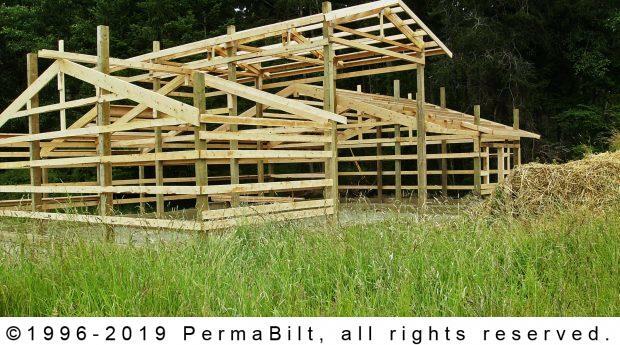 And they saw their new building quickly erected and because the larger posts and interlocking frame can handle heavy loads, fewer structural materials were needed. This saved time and lowered their overall costs relative to other types of buildings. "I thank you for the good looking job done for us. I consider this project a true asset for this community."